Prison employee gave hacksaws to New York escaped convicts, report says. 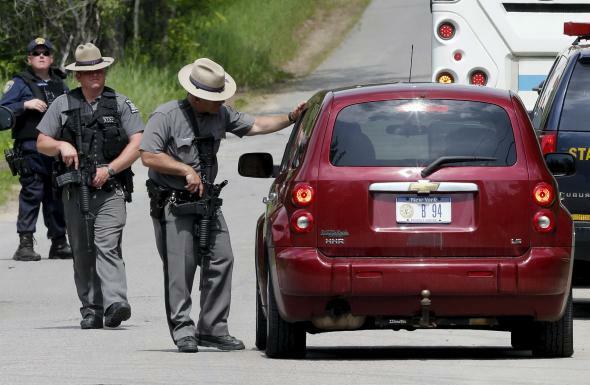 Law enforcement officials at a roadblock near Dannemora, New York in the area of the Clinton Correctional Facility. Hacksaw blades were among the items Mitchell gave to the convicts, two law enforcement sources with knowledge of the investigation told CNN. She also gave Matt two pairs of eyeglasses with lights affixed to them as well as drill bits, one of the sources said. They were purchased over the past few months. Clinton County District Attorney Andrew Wylie confirmed that Mitchell is believed to have provided some material support to Matt and Sweat. He also said that while Mitchell may be prosecuted, she has cooperated with authorities’ investigation and did not provide the power tools the pair used in their escape.